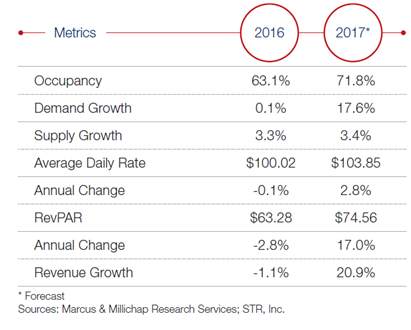 ​​ TEXAS – 2017 is expected to end on a high note for hotels, though at the end of the second quarter 2017, occupancy declined year over year, according to a Marcus & Millichap’s Hospitality Research Texas Report 2H 2017. Nearly all the major state metros, with the exception of San Antonio, registered a decrease in occupancy, average daily rate and RevPAR during the last 12 months. Check out more Austin, DFW, Houston, and San Antonio Hotel Market Research.